alt-text: I can't get any work done because my friend Catherine is sitting on my keyboard. Why do so many old ladies have so many friends named Catherine? TheEngineer wrote: Just tried an "undo" macro and apparently my friend Catherine teaches English to high-school students (which is quite plausible - from the look of the examination results). High school maths being taught by cats would also explain a lot. Ironically, my friend Catherine is actually named Catherine. Well, Katherine, but close enough. Oh, and moody, perhaps it's the SAME Catherine who befriends many old ladies because she knows they'll let her by with her strange behavior. My friend Catherine is buried in my backyard behind the shed. My Friend Catherine just pooped in her box. rmsgrey wrote: High school maths being taught by cats would also explain a lot. Funnily enough (well it probably wasn't quite funny enough, but anyway) we did a whole riff on this on irc the other day after somebody linked a picture of a cat sitting on a TV aerial. We reasoned that the cat would affect the mew-r, the relative purr-meability of the air. There was plenty more, but I can't remember right now. Funnier than referencing signs of iron1 in the Blue Supergiant class of stars. There may well be Mu Normae in that set, but there's also Zeta Puppis and UW Canis Majoris A, which makes for a more awkward joke to tell. 1 i.e. look in the spectra, and identify any Fe-line. I got up a couple of nights ago and my roommate's friend Catherine pooped on the bathroom rug. Looks like he ate something that did not agree with him. There do tend to be a lot of "imagine if this was replaced with that" xkcd strips, don't there? It's not been long since the last one. I left my friend Catherine at my dad's when I moved out of his toolshed a decade and a half ago, and her health rapidly deteriorated until one day I came to visit and noticed she just wasn't around anymore, hadn't seen her in a while. Nobody told me anything about how it had happened or even that it had happened, and I didn't really want to ask. wgrandbois wrote: Ironically, my friend Catherine is actually named Catherine. Well, Katherine, but close enough. Is that spelling supposed to be ironic? My friend Catherine is in heat yet again. As soon as I get the all clear, I'm taking her into to have her spayed. I think the next cat I get (if I ever have one again), I'll name her Herine. My friend Catherine died in my brothers arms while in the waiting room waiting to get her put to sleep. I suppose it depends on what you mean by "ironic" in this case. In the hipster sense, "Katherine" isn't an ironic spelling, unless Katherine Heigl, Katherine Anne Porter, Katherine Litwack (Kat Dennings) and the millions of others who use that spelling had parents who were hipsters (I somehow doubt it). I submit that it's no more ironic or obnoxious than people who name their chocolate lab "Hershey" or their border collie "Oreo". 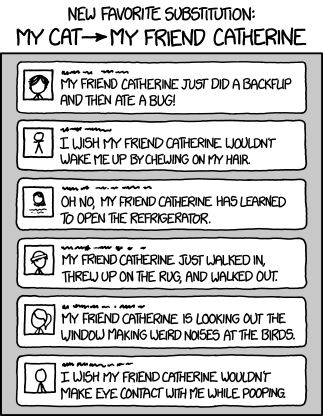 Is it just me, or does "My Friend Catherine" sound like it should be part of a mnemonic to anyone else? My Friend Catherine likes to curl up on my lap while I binge my way through a TV series box set. And then after I've stayed up too late watching One More Episode, she'll gently nuzzle me awake with the dawn so we can have breakfast together. flicky1991 wrote: There do tend to be a lot of "imagine if this was replaced with that" xkcd strips, don't there? It's not been long since the last one. replace "gaze" with "cat" instead. Hilarity ensues. My friend Catherine died of old age when she was 17. I think the irony being seen here is "naming a cat something that could start with 'Cat', but then picking a different spelling." So more like naming a golden lab "Hershey". Mikeski wrote: So more like naming a golden lab "Hershey". My friend Catherine decided he lived with me shortly after I'd moved some furniture into the house. Then my friend Catherine invited friends to move in too. Maybe Catherine doesn't believe in God, or maybe she does (I asked her, but she just looked at me with disdain, which is normal). Either way, that doesn't seem to be a prerequisite for sentience. Indeed I'd absolutely take it further and submit that she is capable of reasoning, and planning based on her experience and observations. She keeps trying to catch me, which I find troubling. She really doesn't like the water though. On the TV there's an advert for Cravendale where the people suffer from the consequences of the cats developing opposable thumbs. I worry about cats learning to swim - apparently some already do? EEEK! You need a harder definition than that, otherwise my computer is sentient. It can feel me typing, and perceive wi-fi signals, and react appropriately to both. Free will (acting counter to instinct/programming, delaying gratification into the future), sense of self (I look in a mirror, and I comb my hair; a dog looks in a mirror, and it barks at the "intruder"), etc. etc. Train a cat not to jump on the kitchen counter by spraying it with a water bottle, and it won't fully understand what's happening. You can put the water bottle on the counter, and the cat will be "scared" of it, not realizing that someone has to pull the trigger. And you don't need "religion" or "God" to get at what I think you're getting at; it can be an areligious philosophical question. Do you have free will, or is every "choice" you make predetermined by the math that runs the universe? Is there a "you" that decides whether to respond to this post, or could someone write out the equations that will determine whether the right neurons fire in your brain or not? Maybe this a religious standpoint (I wouldn't know - not really my thing) but anyone who has spent any time with a cat surely wouldn't question whether she is "sentient" ? Star Trek (the source of the above-mangled poem) consistently uses "sentient" in place of "sapient". This peeves me. Mikeski wrote: Is there a "you" that decides whether to respond to this post, or could someone write out the equations that will determine whether the right neurons fire in your brain or not? For me, the answer to both questions is "yes". The "me" deciding whether to respond to this post is simply an emergent property of the math. I can see why thinking this way would result in existential angst for some people, but the idea has never bothered me. Solra Bizna wrote: For me, the answer to both questions is "yes". The "me" deciding whether to respond to this post is simply an emergent property of the math. I can see why thinking this way would result in existential angst for some people, but the idea has never bothered me. I likewise feel no inconsistency in believing in free will in a deterministic (or, worse. a fundamentally indeterministic) universe. Because, again, free will is an emergent property. Solra Bizna wrote: Star Trek (the source of the above-mangled poem) consistently uses "sentient" in place of "sapient". This peeves me. That definition of "sentient" isn't exclusive to Star Trek. It's pretty common usage, especially in sci-fi. elasto wrote: I can do anything I want to do; What I can't do is something I don't want to do. I don't think anyone can act counter to their programming. Delaying gratification is possible to some extent for most adult humans; but I wouldn't count it as a prerequisite for sentience. I would look more into things like: can it suffer? Can it want things? What have you suffered? What do you want? My problem with this bit of sed is that it sounds really awkward when used to talk about male friends named Catherine. My friend Catherine is actually called Biggles, and although the vet took care of his external maleness issues, he's still a tomcat. However, I can't think of a male gendered name starting with Cat, Mr Stevens notwithstanding...? And grep Cat /usr/share/dict/words hasn't been any real help, either. I wrote 'can' suffer and want. I didn't say 'has' suffered and wanted For what it's worth: I want sesame ice-cream; and I've suffered a teensy little bit from my headache yesterday. I think the only way to tell if something can suffer is if they have suffered before. Or if they have nervous systems sufficiently similar to other creatures that have a known capacity to suffer.